St. Martin's Paperbacks, 9781250067326, 352pp. 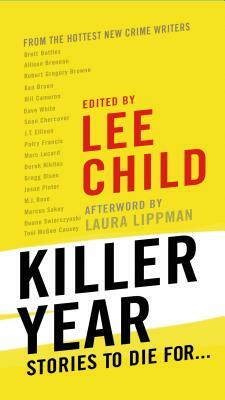 Killer Year is a group of thirteen authors whose first novels were published in the year 2007. Now, each member of this widely-praised organization has written a story with his or her own unique twist on the world of crime. Each entry in this one-of-a-kind collection is introduced by the author's Killer Year mentor, including bestselling authors James Rollins, Tess Gerritsen, Jeffery Deaver. Other contributors—of original stories, essays, and commentary—include acclaimed veterans Ken Bruen, Allison Brennan, Duane Swierczynski, Laura Lippman, and M.J. Rose. This is a book that no fan of the genre can do without. LEE CHILD is the number-one internationally bestselling author of the Jack Reacher thrillers, including the New York Times bestsellers The Enemy, One Shot, The Hard Way, and the number-one bestselling novels Bad Luck and Trouble and Nothing to Lose. His debut, Killing Floor, won both the Anthony and the Barry Awards for Best First Mystery, and The Enemy won both the Barry and the Nero Awards for Best Novel. Child, a native of England and a former television director, lives in New York City.